At Rhythm Systems, our consultants are trained facilitators. We have facilitated hundreds of successful Strategic, Annual and Quarterly Planning sessions as well as weekly meetings for our clients. And as much as we love doing this for our clients, we know that we can’t be there to facilitate every meeting. 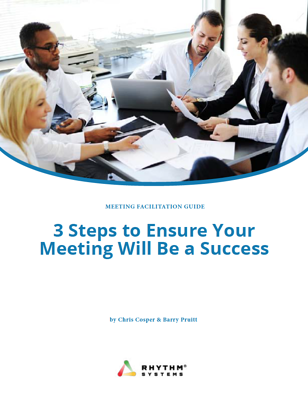 This guide provides insights to help you run a successful meeting on your own. love doing this for our clients, we know that we can’t be there to facilitate every meeting for every client. That’s what this guide is for.